Hello and welcome to Bramall Lane where Millwall aim to upset Sheffield United and potentially move further away from the bottom three. It was a 1-1 draw here last season, Steve Morison's equaliser two minutes after Leon Clarke's opener keeping the Lions in sixth place as they chased the play-offs. Millwall have failed to score only once in seven games against Sheffield United under Neil Harris. After three successive wins for Harris against Nigel Adkins and then Chris Wilder's sides, there has been one victory in the last four. 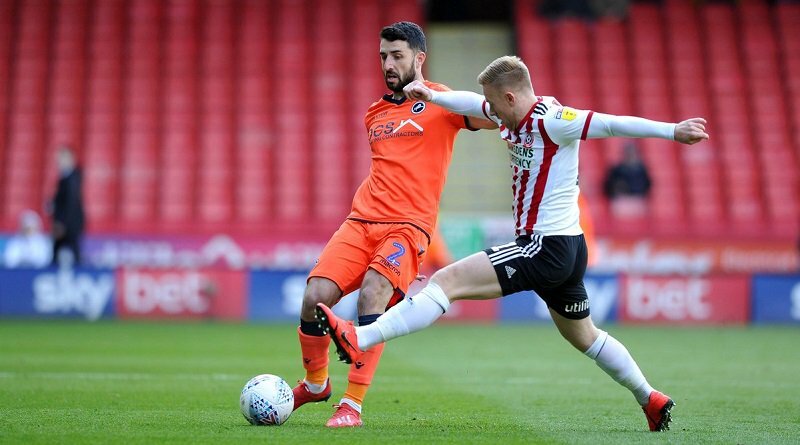 And earlier this season, the Blades came from behind to defeat Millwall 3-2 at The Den. The sides are in very different positions in the Championship table, but Millwall are putting in some good performances recently and will be confident of upsetting the promotion-chasers. Neil got them up and the year he did, the two most powerful clubs in the division got the top two. If you look at Bolton's squad, okay there was a lot going off, but they had the players to win games of football which they did. We got a lot of plaudits last season for the way we played but, if you look at it, what Millwall did and what Preston did outstripped what we did. We could easily have had the season that Millwall are having. It might be disappointing but it's not a disaster season with them, no way at all. If they stay up, they'll be delighted. We're both working class football clubs with the right ethic and commitment. But through the years, listen, they've had some players. Just like we have here." There's a snobbery in football. Without being too deep on it, there's a class opinion on what football clubs are and the hierarchy and the elite. Last year, we got a hell of a lot of plaudits for how we played. But what they did and what Preston did topped what we did really. If you dip your toe in at Millwall, you'll get found out with the supporters. They're the same as here. The fans come to watch football, they're not bothered about the corporate stuff, the hospitality or getting a glass of fizz. MILLWALL TEAM TO PLAY SHEFFIELD UNITED: Martin; McLaughlin, Pearce, Cooper; Romeo, Tunnicliffe, Leonard, Thompson, Fergie; Wallace; Gregory. SUBS: Amos Meredith, Williams, Elliott, Morison, O'Brien, Marshall. It looks like 3-5-2 for Millwall, with McLaughlin right side of a back three, Romeo and Ferguson the wing-backs. Or more conventionally, McLaughlin left-back, Romeo right-back, Ferguson left midfield. All Blades in these early stages, they're zipping the ball around so quickly and #Millwall are booting it clear. McLaughlin well in in midfield to win the ball. #Millwall not giving the Blades much room to play. #Millwall break as Wallace finds Tunnicliffe who passes to the overlapping Fergie. But the wing-back's cross goes over Gregory, who was the only attacker in the box. #Millwall have succeeding in quietening the home crowd in the opening 15 minutes. Fleck lofts a ball into the box but Martin takes. #Millwall frustrating the home side. 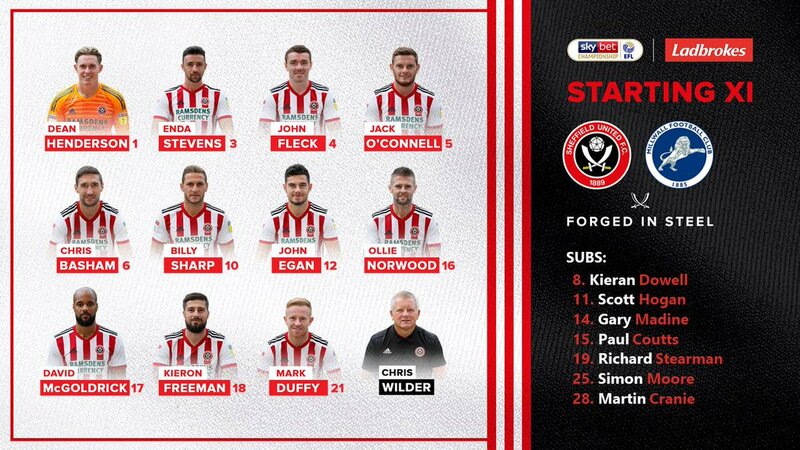 A 4-2-2-2 for the Blades at the moment. Changes things for #Millwall, obviously, who went three at the back to match their opponents. Poor delivery and #Millwall clear. HT - Sheffield United 0-0 #Millwall The visitors will be pleased with that, even of they have done little in attack. Blades are more threatening, but the home crowd have had little to shout about. 661 #Millwall here today in 26,073 crowd. #Milwall under real pressure as Pearce blocks McGoldrick's shot and Norwood's effort deflects for a corner. Martin then comes off his line to claim it. Marshall will be on soon for #Millwall. #Millwall have responded well and Thommo's cross deflects out for a corner. Marshall on for McLaughlin for #Millwall. Blades clear the corner, Wallace stops a counter and is booked. #Millwall in a 4-4-1-1, Marshall left side of midfield. Chance for #Millwall as Tunnicliffe finds Gregory who might be in...but he'd gone offside. Elliott on for #Millwall, Tunnicliffe off. #Millwall are committing a lot more players forward now as they chase an equaliser. Another change for the hosts, Coutts on for Duffy. #Millwall clear it but the Blades regain possession and now have a free-kick in the Lions' half. #Millwall have a free-kick on the right, Marshall to take...Elliott heads it but it's straight at Henderson. Wifi dropped. #Millwall penalty, Marshall has hit the bar. More reaction coming up on NewsAtDen.